This entry was posted in Emerging Occupations and tagged journalism by Michael Mandel. Bookmark the permalink. OK, that’s interesting, but it seems to be missing a crucial piece of information. How many journalism jobs are we talking about? I’ll be it’s a much smaller number than ever. According to BLS data, there were 80K news analysts, reporters, and correspondents in 2009. In the year ending May 2013, our calculations from the CPS show 86K. Now, this says nothing about salary etc. But it seems the number has gone up rather than going down. The growth in “talking heads” has not been consistent and is down 12% since 2008. Agreed that the government numbers have been bouncing up and down, potentially because of sampling error. 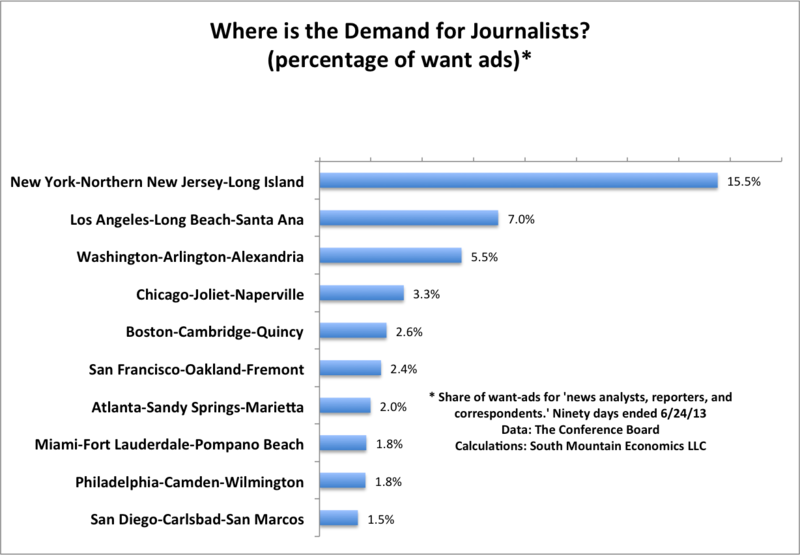 That’s why it’s important that help-wanted ads for ‘news analysts, reporters and correspondents’–a completely separate data source–have also surged over the same period. The help-wanted database, from The Conference Board, is not a sample, but a count of all the ads out there, categorized by occupation. The categorization is not perfect, but it is very useful. The other point that I didn’t mention is that editors are a separate occupation. Based on both the CPS and help-wanted data, the job gains for editors have been considerably weaker than for news analysts, reporters, and correspondents. My personal theory is that the changes have cut out a layer or two of editors/management. Oh, there’s no doubt that the number of print journalists has fallen, as you note. But please dont omit the rapid growth of digital news from the same report. This is why I class ‘journalism’ as an emerging occupation–the nature of the skills and tasks are changing rapidly. Sorry for the late reply. Yes, agreed, digital is growing rapidly, but most of those jobs are low paying and for the lesser experienced. But I don’t think the skills are changing. The technology is different; the distribution and delivery system is different. But acquiring information, discerning between fact and opinion, and knowing what to ask and how to ask it remain skills that typically do not come to the inexperienced. Check out the conversation between Bill Keller and Glenn Greenwald in the NYT over “new” journalism. Much of the time, you can’t tell who is speaking because they are more on the same page about journalism than not. And that’s a good thing.